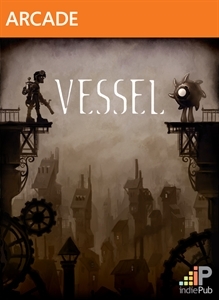 Namco Bandai has signed a distribution agreement with indiePub to release three downloadable titles, Vessel (announced and released for PC) being one of them. Arkwright, to stop the chaos they are causing. Vessel is a game about a man with the power to bring ordinary matter to life, and all the consequences that ensue. Vessel is built on an optimized liquid simulation featuring flowing water, scalding lava and steam, reactant chemicals, glowing goo, the mysterious protoplasm, and more. Each liquid has unique properties and mixes with other liquids for dramatic effects. Interact with Fluro creatures that are formed entirely from simulated liquid. Each retains the properties of the liquid they're made of, giving them the ability to melt, reform, absorb, explode, and more. Solve puzzles by combining the unique behaviors of each creature with the fluid they're created from. Every aspect of the world is physically simulated, and all puzzles are based in the liquid simulation. Drop a Drinker Fluro and lure him by spraying goo. Create a Dark Fluro and chase him with light. Liquid and physics are not an aesthetic in Vessel, but the foundation of gameplay. Use the mysterious protoplasm liquid found in the world to upgrade your equipment, obtaining powerful new ways to manipulate liquid. Explore a world of fantastic, detailed machines and strange, wondrous environments. 2D hand-drawn textures combined with 3D normal maps, lighting, and depth creates a unique, other-worldly look to the visuals.